The Earth is a fragile thing that could even destroy itself, Pope Francis told astronauts on the International Space Station (ISS) on Thursday, saying they had an opportunity to see the planet “from the eyes of God”. 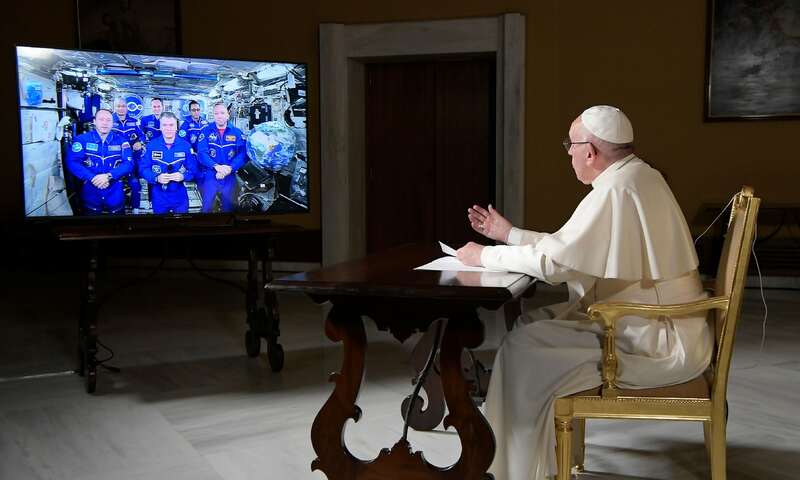 The voice of Pope Francis was heard in the heavens when he made a 20-minute video call to six astronauts to talk about life’s biggest questions – including their opinions on love, their sources of joy and how life without gravity changed their view of the world. The US astronaut and mission commander Randy Bresnik told the pope that they saw a world without borders or conflicts from their point of view above the Earth. .
“What gives me the greatest joy is to look outside every day and see God’s creation – maybe a little bit from his perspective,” Bresnik, 50, told Pope Francis. Far from wars, famines, pollution or human folly, he said “the future of humanity looks better from up here”. The pope replied that Bresnik had “managed to understand that the Earth is too fragile and it passes in a moment”. Italian astronaut Paolo Nespoli, 60, admitted that despite the bird’s eye view of Earth from the ISS, he too remained “perplexed” about a human’s place in the world, while American Mark Vande Hei said seeing the planet from space made them “realise how fragile we are”. The Argentinian pontiff sat at a Vatican desk, facing a widescreen television on which the astronauts from America, Russia and Italy could be seen floating together in their blue suits. “Astronomy makes us think about the universe’s boundless horizons and prompts questions such as ‘where do we come from, where are we going?’” the pope mused.